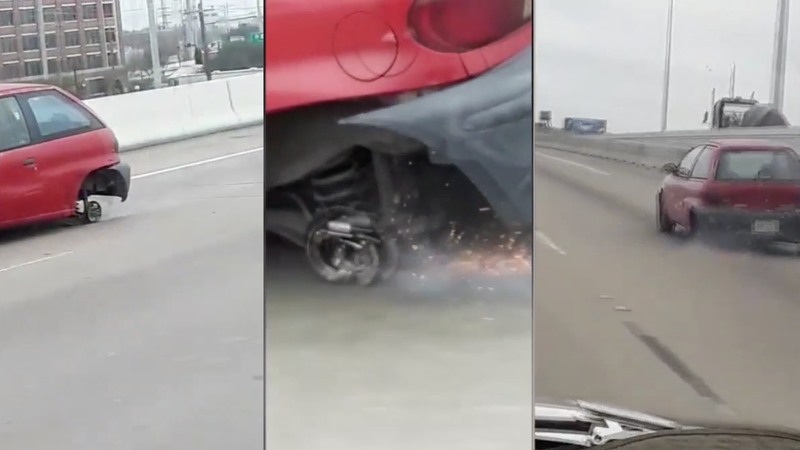 What appears to be the humble Geo Metro, a modern example of dependable, rugged quality (these claims could not immediately be verified), and I can’t think of a better example of its numerous superlatives than its capability of driving with only three wheels, like in this video from Houston. The witness who recorded the clip said the car was speeding down US-59, with sparks showering up from under the vehicle, according to ABC 13. There’s no indication of what happened to the car running on its rapidly atomizing brakes after the video ends. I will now extrapolate what I think happened after the video was recorded: I think the Geo driver arrived to their destination, poured the rest of an old Arizona Tea can that’s been in the cup holder for three days on the knob that was on fire, and went about their business. And you know what? I bet they’re going to finish that business and get right back in their car, right back on the highway, and do it every day until they start scraping the gas tank and things either get very much covered in flames, or just all of the fuel leaks out and they can’t drive the car anymore. The only thing different between this and your personal daily commute is probably increased road noise and a few more sparks.